In 1905, just before the law separating Church and State was signed, Gustave Jossot, a gifted, nonconformist, anti-clerical, anti-just-about-every-kind-of-authority, caricaturist and poster maker, drew one of France’s first political posters. When in 1913 he moved to Tunisia and converted to Islam, he was once again bucking the ideas of his times. 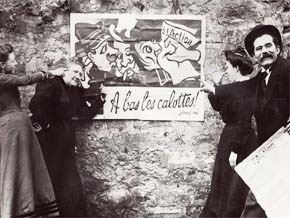 His art work inspired the new generation of french caricaturist : Siné, Cabus, Charb, Honoré, Riss, Tignous, Besse, Lolmede, Luz, Willem, Catherine. The team of Charlie Hebdo, Siné Mensuel and Le canard enchainé used to make references about his works. The film explores Jossot's world, North and South.